A third European club competition with the working title 'Europa League 2' will be introduced from 2021. As part of Uefa's 2021-2024 cycle, the Europa League will cut in size to 32 teams with an extra play-off round between the group stage and last 16. Every country's champions will still enter the Champions League, but only teams from the 15 top-ranked countries will go into the Europa League group stages or qualifiers. That means teams from leagues below that level - which at the moment would include Scotland, Wales and Northern Ireland, excluding their champions - would go straight into 'UEL2' qualifying rounds. The new competition and Europa League will have the same format - eight groups of four teams with the winners going into the last 16. There will be a play-off before that round for the teams who finish second in the group and sides who finish third in the groups of the higher tournament. The winners of the tournament will qualify for the following season's Europa League. 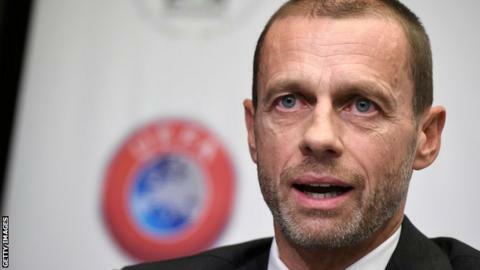 Uefa president Aleksander Ceferin said: "The new competition makes Uefa's club competitions more inclusive than ever before. There will be more matches for more clubs, with more associations represented in the group stages.